With your large group of family and friends, it is easy to load up this Volante fifth wheel and head out to your favorite campground for a week of vacation. 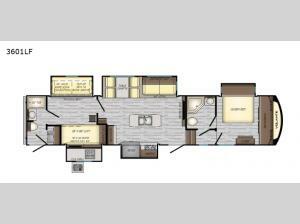 From its five slides to its two full bathrooms, this model truly was built with your family in mind. The private bunkhouse with its trundle bed and loft, the queen-size bed, and 64" sofa are what allow this unit to sleep nine people making sure that there is a spot for everyone! This model also features two entry doors and two kitchens (one indoor and one outdoor), and the electric awning with LED lights is what provides shelter as you gather together next to the campfire at night.